"The mammalian and Botryllus blood-forming systems also share hundreds of homologous genes, even though the two species are separated by over 500 million years of evolution," said former postdoctoral scholar Benyamin Rosental, Ph.D.
Rosental shares lead authorship of the study with graduate student Mark Kowarsky. The senior authors are Irving Weissman, MD, the Virginia and D.K. Ludwig Professor for Clinical Innovation in Cancer Research and professor of pathology and of developmental biology; Stephen Quake, Ph.D., the Lee Otterson Professor in the School of Engineering and professor of bioengineering and of applied physics; and senior research scientist Ayelet Voskoboynik, Ph.D. The researchers isolated the Botryllus stem cells that are the foundation of its blood and immune system, as well as the progenitor cells they make on their way to becoming adult blood and immune cells. "Out of all the invertebrates, the Botryllus blood stem cells and progenitors are the most similar to vertebrate blood cells, so it is possible, if not likely, that they are the 'missing link' between vertebrates and invertebrates," said Weissman, who also directs the Stanford Institute for Stem Cell Biology and Regenerative Medicine and the Ludwig Cancer Center at Stanford. Botryllus is an organism with many odd characteristics. It lives part of its life as a free-swimming chordate "tadpole"—an animal without vertebrae but with a spinal bundle called a notochord. 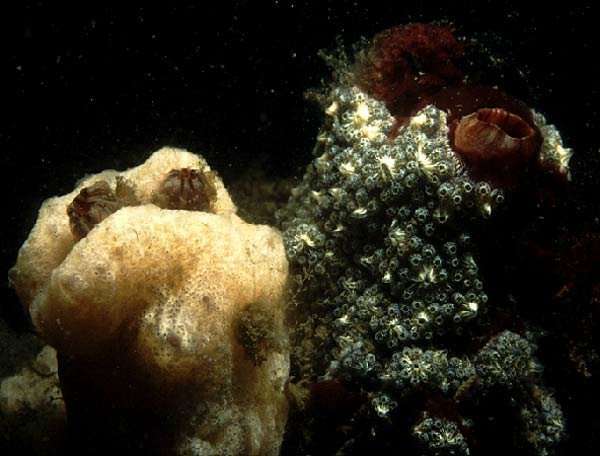 Then it attaches itself to a rock, undergoes metamorphosis to lose its notochord, tail, body muscles and one of its two brains, and settles down to live in colonies with other Botryllus organisms on the subtidal surface. Under the microscope, a Botryllus colony looks like a bouquet of flowers, although in reality each "petal" is a separate organism with its own heart, gills, digestive system, brain and blood cells. The separate Botryllus organisms in the colony share a common blood supply, and even exchange cells. This blood sharing allows stem cells for sperm and eggs and stem cells for body tissues to be shared throughout the growing colony. Previously, researchers in the Weissman lab showed that a single variant of a gene called BHF regulated whether separate Botryllus organisms would send out blood vessels from their own bodies and merge with adjacent individuals, or undergo an immune rejection, preventing blood cell exchanges. The new study identifies how BHF regulates whether organisms fuse together in the colony: If the protein produced by the gene is recognized as compatible by the other colony, it prevents the activation of a rejection process that is similar to the way that the human immune system's natural killer cells attacks tissues that are not "self." The discovery of such strong parallels between the two systems offers researchers an excellent model for studying many biological phenomena in mammals, the researchers said. "Blood stem cells in mammals are hard to find and, when found, it's very hard to follow what is going on in the blood stem cell niche," Voskoboynik said. "Botryllus is a translucent organism, so we can easily spot the niche and visually follow the migration of each type of cell from one part of their body to the other." It's also easy to observe how the cells in individual organisms interact when one mounts an immune attack against the other, or the two individuals fuse blood vessels. This could provide scientists with a better understanding of why an organism accepts or rejects foreign cells, knowledge that could give insights into organ transplant acceptance and rejection, Voskoboynik said. "With its primitive but effective immune system, Botryllus may also give us insights into how we can boost our own immune responses to pathogens and cancer," Voskoboynik said. "But in addition to any practical benefits this research may produce, we are delighted to explore this important guidepost on the path to understanding the evolution of vertebrates, and of their blood-forming and immune systems. Isn't that what curiosity-driven science is supposed to do?"